They have big teeth too! Well it's spring. It is a time when, according to Tennyson, a young man's fancy lightly turns to thoughts of love. Being an old grizzled coot firmly in the grip of matrimony for more than a score of years now, my fancy begrudgingly turns instead to the spring return of every pilot's nemesis, the thunderstorm. I fondly recall a time years ago while sitting in Air Force ground school in Lubbock, Texas. The instructor drew a shape on the board and asked us students to identify the shape. It looked like the state of Texas which some brave soul ventured to point out. The instructor corrected him with a shouted "NO". "That," he exclaimed, "is an airborne emergency!" His meaning was that flying in the state of Texas in the spring meant doing battle with, or rather attempting to avoid doing battle with the towering giants which would daily sweep across the panhandle. 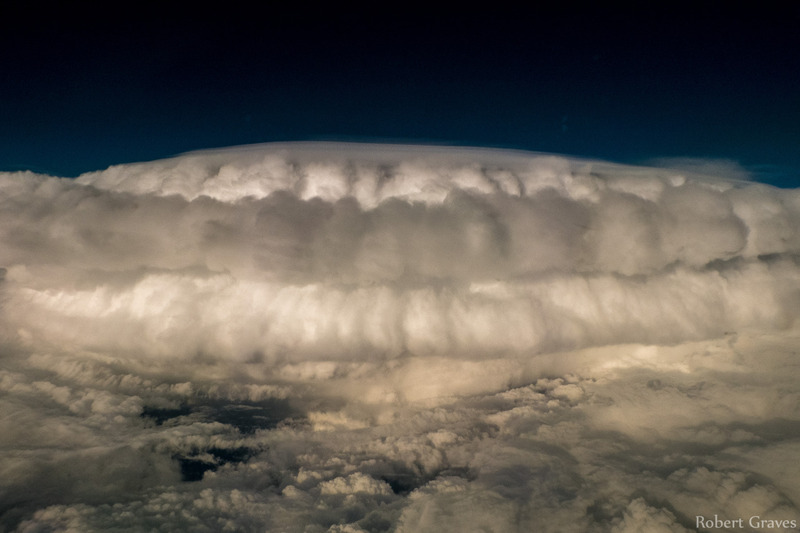 Because even today, with all of our technology and shiny fast moving flying machines, there is still virtually no airplane that can survive a thunderstorm penetration. And I'm including everything from fighters to helicopters to especially airliners in this category. But wait, you cry! How about those hurricane hunter planes? Aren't hurricanes worse than thunderstorms? Actually no, they're not. At least not in an airplane. A hurricane can certainly muss your hair while airborne, but they are mostly lower altitude phenomena and have limited vertical development. There may be thunderstorms embedded in a hurricane which the hunter aircraft are careful to avoid, but overall, nothing on earth can match the fury of a well developed hammer-headed storm reaching to over 50,000 ft.
Ok, but can't we just fly over them? No, again. Most airliners can only climb up to the low 40s whereas I mentioned above, a large storm can easily reach to 50k. Even should the storm be a "smaller" one and top out in the 30s, the area above the storm can be quite turbulent as the storm grows and should hail get ejected out of the top of one of these babies, that's exactly where you'll find it. So no, going over a developing cumulonimbus is never a good idea. It is always best to avoid a storm laterally. Wandering into one of these bad boys will easily make the top of your list of worst things to happen in an airplane. The gusts from violent up and down drafts will produce severe turbulence and the volume of rain your engines will swallow can easily put the fire out. An encounter with hail will scratch your shiny paint job just microseconds before it permanently bashes your radome and the leading edges of your wings into a very non aerodynamic shape. And that is if your windshield doesn't shatter. Thunderstorms are to be avoided at all cost. Our trip had us returning from an international destination to be followed by the last leg to Chicago. Then we were done. My F/O lived in base so he was just going home while due to the late arrival time, I was going to the crash pad to be followed by an early morning flight home. We parked the jet at the international terminal, cleared customs and went to look for some dinner before meeting another jet in the domestic terminal. My F/O was diverted away from the automated kiosk into the longer line to an agent for some reason so I'd catch up with him later. I made a quick trip by the pilot lounge and then went to the gate to meet the incoming aircraft. We were supposed to push at 8:00 pm but the board said the flight was expected out at 8:25. It pulled into the gate dutifully at 7:50 meaning that this was planned for a 35 minute turn. We used to do these in as little as 15 or 20 minutes, but the planes are bigger and people are slower and carry more stuff to stow, hence the 35 minute turn. The reason I stopped by the pilot lounge was to get a wifi signal to update the weather app on my iPad. The company spent a ton of money to give us all iPads with a comprehensive weather app. The only problem is that it's useless without a wifi connection, and we're not allowed to use the onboard wifi. This makes the whole thing quite useless for weather. Rumor has it that this will change soon but I'm not holding my breath. What I did see during my brief lounge visit was that a large system of thunderstorms was camped out just east of the Mississippi river valley, stretching from perhaps eastern Arkansas up to southern Michigan. I guessed that this meant that we were not going to be flying the most direct route. It turns out I was correct. When I got the flight plan, it showed that we were going to take a very circuitous route to Chicago. We were routed north over Oklahoma City and then to Omaha followed by Fort Dodge, IA at which point we'd make a turn to the east. I don't know if our dispatcher came up with this route by himself or whether it was given to him by air traffic control, but it was what we were given. What we were also given was a ton of fuel. The normal route should take about two hours, but this roundabout route was going to be 2+45. The 737 burns about five thousand pounds an hour, plus we have to have our required reserves of 45 minutes of extra gas. On top of that we had gas for two alternates listed as Detroit and Columbus, and also extra fuel in case we had to hold. All of that fuel added up to about 27 thousand pounds. Now it has been said that the only time you've got too much fuel on board is if you are on fire. While true, having too much fuel when you're trying to land on a short runway in bad weather can be a problem as well. More gas means a heavier airplane. And the Chicago weather was forecast to be ok for our arrival, but thunderstorms were threatening. Another limitation is our structural landing weight limit. There is an upper weight limit for landing that must be met. Carrying too much fuel might put us above that limit in which case we'd have to burn it off or divert. 737s cannot dump fuel like many other aircraft. The dispatcher put a note on the release to pump us up to 29 thousand pounds if other limits were met, but come push time, the extra fuel never showed up. I was fine going without it as we were planned to land with 12 thousand pounds, about double what we normally have on landing. After a last minute runway change requiring new takeoff data, we blasted off at about 8:45. The sun had set and there was a beautiful blue orange glow to the west. Also visible was a rather large storm several hundred miles distant. It turned out to be over central Texas but we could see it perfectly from Houston. Air traffic control stopped our climb at 37,000 feet, 2000 feet shy of our planned 39,000 ft. I assumed that this was due to other traffic conflicts. My hat is off to the controllers who must not only keep all the airplanes separate, but who must also thread all their traffic through a constantly shifting map of storms. As an additional challenge, their radar systems do not show weather very well. They rely upon pilots to tell them where they can and cannot go. It's crazy, but I have apps on my phone that have better weather readouts than that. We watched the lights of the Dallas Metroplex go by followed by Ok City and Kansas City off to our right. Prior to getting to Omaha we were cleared to cut the corner to Fort Dodge. It was at this point that things started getting funky. We were first cleared one arrival over Joliet, and then quickly by another arrival farther to the north. Finally, the controller just gave us a northeasterly heading and a descent. 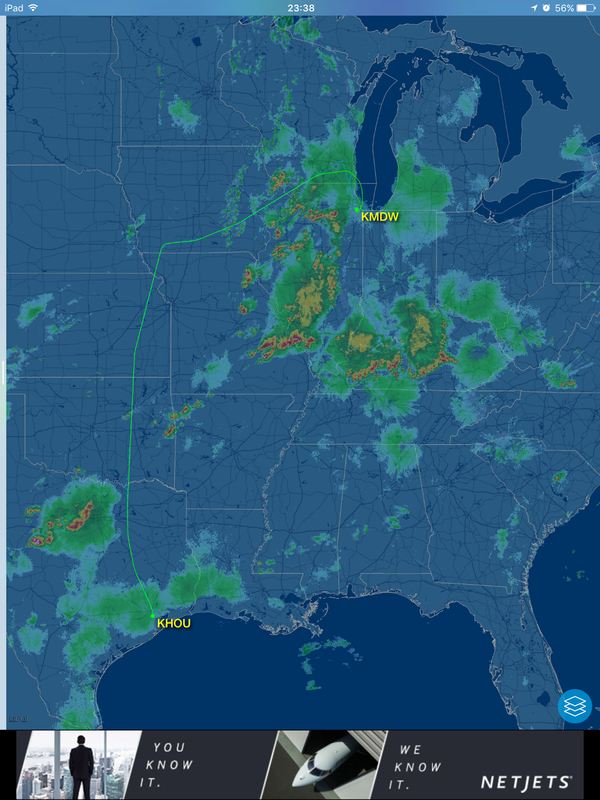 Storms were approaching Chicago from the west and were closing the normal arrival routes. Controllers have to get very creative when this happens. We were lucky that our arrival was so late as the traffic flows were diminished. Had this happened during peak arrival times, we would likely have held or diverted. The new plan was to take us in north of the city, over the lake and south to Midway. The controller's challenge was to get us across the arrival traffic going into O'Hare. For this he had us expedite our descent to below their arrivals. I was also thinking about my possible options should Midway get hit by a storm. One of our alternates, Columbus, was already being hit by a storm but Detroit was still good. Since we were only a few miles south of Milwaukee by this point, I checked the weather there. Their visibility was only 1/8th of a mile which made that not a great choice. Behind us, though, was Minnie which had good weather. Like a quarterback, you're always keeping an eye on your open receivers while you avoid the linebackers. We got fussed at several times to expedite our descent below the O'Hare arrival corridor. The problem is that to increase descent, one must increase airspeed by pointing the nose lower. We were also getting the poop knocked out of us by turbulence, and our turbulence airspeed is only 280 kts. So we do the best we can to get down without beating ourselves or our passengers up too much. Once we were below the bumps and over the lake we broke out of the weather and everything smoothed out. We were given a turn to the south and enjoyed a beautiful view of downtown Chicago from the north which we almost never see. After passing downtown we were given a vector to the downwind to runway 4R at Midway. Abeam the airport the controller cut us loose and cleared us for the visual. This rarely happens any more and I used the opportunity to hand fly the approach just like we always did in years gone by. Off went the autopilot and autothrottles. My flying skills may get a little rusty when using all the magic day after day, but the rust knocks right off and I rolled out on glidepath right at a thousand feet fully configured. The aviation gods smiled upon me because I had one of the best touchdowns at Midway that I've had in a long time. The runways are short, so you normally just try to not land long and accept whatever kind of touchdown you can manage. Well, we taxied clear, contacted ground and the company to let them know we were there, and of course, as day follows night, after a long day and delays, we have to hold out for our gate. Then we get assigned another gate, then back to yet a third gate, and then we wait for marshallers to guide us in. The important point here to remember is that if you shut down an engine, you will then likely be required to turn into your running engine. Think of trying to turn left on ice when only your left rear tire is turning. It doesn't want to go. Anyway, we get it shut down, I even get a compliment about the landing, and then it's off to the crash pad for about four hours of shuteye before my flight home. Well as they say, it's hard work, but it still beats working for a living. Well, Margarita, they tell us to not scare the passengers. I personally think, though, that people would rather have the unvarnished truth!